The Analytical Cytometry Core Facility originated in 1987. It as a part of the Central Laboratory of Immunology and is currently housed in the main building of NCIPD. It functions as an open access facility offering variable sophisticated flow cytometry techniques. We have established collaborations with the Medical Universities in Sofia, Plovdiv, Varna and Pleven, the Biology Department of Sofia University, the institutes of Microbiology and Molecular Biology at the Bulgarian Academy of Sciences,etc. Over 20 teams in different areas of basic and applied science have taken advantage of our services, 26 young researches have received post-graduate training and have accomplished their PhD thesis with us. We support a wide range of research and clinical areas: normal haematopoiesis, leucocyte differentiation markers, stem cell and mesenchymal cell characterisation, phenotyping of malignant lymphoproliferations and MRD, regulation of mature lymphocyte functions, secondary immune deficiencies, vaccine and immunomodulation research, etc.Within this multi-user environment, the highly qualified facility staff collaborates in training, experimental design and data analysis, development of flow cytometry techniques, appraisal of new technology and quality assurance. expertconsultation in pre-project experimental design, data acquisition, analysis, presentation, and publication. CCF has currently two flow cytometers and one cell sorter. These instruments are user-friendly and standard protocols are available for various applications. Following a brief tutorial, investigators/students may analyze their samples independently. Our goal is to maximize the productivity of the users. Flow cytometry is a powerful and effective laser-based tool for analyzing the structural and functional characteristics of cells or particles in a heterogeneous suspension. Flow cytometry, typically using fluorescent probes which bind to specific cell associated molecules, allows measurements of various phenotypic, biochemical and molecular characteristics of individual cells (or particles) suspended in a fluid stream. 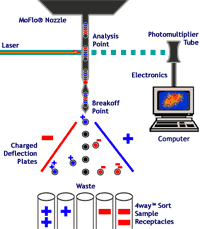 The flow cytometer consists of a light source, collection optics, electronics and a computer to translate signals to data. The light source of choice is usually a laser which emits coherent light at a specified wavelength. 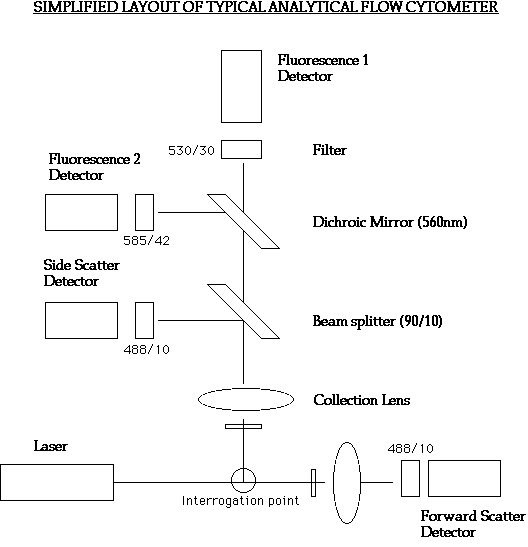 As the cells flow past a focused laser beam of appropriate wavelength, the probes fluoresce and the emitted light is collected and directed to appropriate detectors Scattered and emitted fluorescent light is collected by two lenses (one set in front of the light source and one set at right angles) and by a series of optics, beam splitters and filters, specific bands of fluorescence can be measured (Fig. 1 and Fig. 2). Speed and analytical power: flow cytometers evaluate cells at an extremely rapid rate (e.g. up to 20,000 events per second) and provide reliable and accurate quantitative analysis of selected physical properties of cells of interest. Cell sorting: specifically equipped flow cytometers can also separate (sort) cells of interest from mixed populations for the purpose of further cultivation and analysis. One of the properties of the larger flow cytometers is the ability to electronically deflect cells with preset, defined properties into a separate collection tube. Flow cytometry is especially well suited for applications requiring high purity. Cell sorting by flow cytometry can separate complex mixtures of cells on the basis of multiple marker expression. Subpopulations of cells or particles that have been resolved by fluorescence or physical parameters can be isolated at up to 99% purity for further experimentation by using the instrument's cell sorting capability. Cell populations can be collected at rates of up to 5,000 cells/second, maintaining sterility to allow for subsequent culturing of the sorted cells. Sorted cells may be collected into tubes (bulk sort) or deposited into multiwell plates using the ACDU. The ACDU is the automatic cell deposition unit and utilizes the CloneCyt software for sorting from 1 up to 100,000 cells per/well. This can be useful for cloning transfected cells, hybridomas, etc. It can also be useful in a preparative manner to sort exact numbers of feeder or co-stimulatory cells into wells. INDEX SORTING allows identification of exact cells from the sort regions that are placed into individual wells. The number of cells that can be sorted depends upon factors such as frequency of events to be sorted, total number, required purity and these can be discussed prior to sorting. Sheath fluid used is sterile PBS unless otherwise instructed, whereupon you will be required to provide the facility with sufficient sheath fluid the day prior to sorting. Temperature control of the sample and collected cells can be set from 4 degrees C up to 37 degrees C.
Flow cytometry plays an integral role in the understanding of many biological processes: cell cycle and cell growth, cellular DNA and RNA content, cell function and activation, cell differentiation, apoptosis, mitochondrial activity, Ca++ release, hydrogen peroxide production, changes in the plasma membrane potential, intracellular pH etc. Detection of nuclear proteins, oncogenes, and growth factors cytoplasmic enzymes, hormone receptors, and transport proteins Cytometric analysis is not limited to the study of mammalian cells. This technology can also be applied to lower eukaryotes (i.e. yeast) as well as bacteria. Cell cycle kinetics and various aspects of metabolism can be studied. Cells of interest can be sorted and clonally propagated eg for colony assays, generation of cell lines, RNA analysis, FISH, microarrays, PCR and cell micromanipulation. Flow cytometry is used extensively for immunophenotyping of circulating white blood cells for the purpose of: leukemia and lymphoma characterization, MRD monitoring; determination of T and B cell subset proportions and absolute counts for immune deficiency diagnosis and monitoring; cross-match studies and stem cell content monitoring in transplantology; multi-drug resistance, nuclear ploidy and cell cycle determinations in oncology; reticulocyte and platelets counting, etc. Flow cytometry is a basic tool for development, characterization and standardization of monoclonal antibodies for diagnostic and therapeutic purposes. FCM of microorganisms and other small particles is a promising tool in the fields of aquatic ecology, algal and phytoplankton ecology, food industry, etc. The first flow cytometers in Bulgaria started to function in 1987: here, in NCIPD, and in the Laboratory of Immunology of the Medical Academy in Sofia. Twenty years later at least 15 university and private medical laboratories are equipped with flow cytometers for routine diagnostic and monitoring tests. At the same time numerous research teams, laboratories and institutes engaged in basic research and applied biotechnology are still lacking accessible state-of-the-art cytometry techniques and competent consultation. The flow cytometer is available for biological cell analysis and can be operated at a rate of up to several thousand cells per second. This instrument collects information on light scatter (indicating approximate cell size and complexity of interior cell structure) and up to four colors of fluorescence emission. 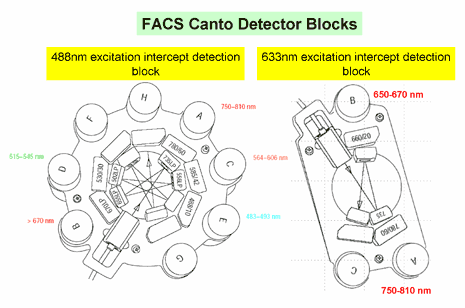 FACS Canto is a fixed-alignment benchtop analyzer. It is approved by FDA and EU for in vitro diagnostics (IVD) and is available basically for clinical cell analysis. This instrument collects information on light scatter (indicating approximate cell size and complexity of interior cell structure) and up to 6 colors of fluorescence emission at a rate of up to several thousand cells per second. Equipped with loader. Post acquisition compensation possible. The laser beams are then routed via fiber optics to the beam-shaping prisms where two lasers are projected onto separate spots in the flow cell. 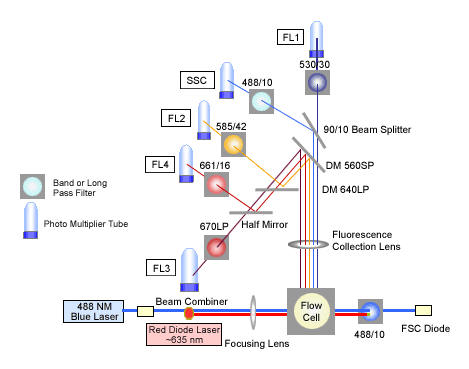 Here, the particles intercept with the laser excitation beams and optical signals are collected at the backside of the flow cell with a gel-coupled collection lens. The optical gel, with a refractive index matched to the lens, maximizes the efficiency of light collection. 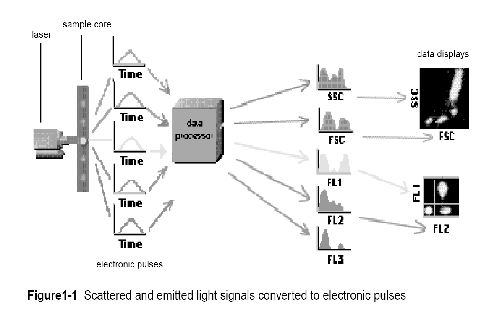 Scattered light and fluorescent signals are then focused onto the emission fiber pinholes. The flow cell is incorporated into the optical plate, creating a solid excitation and collection system with fixed alignment, and no need for user intervention. ACCF provides a variety of workstations and software options for users. as well as Intranet, Mass storage and Network printers: Brother HL2040, Tektronix Phaser 860 color PostScript printer. 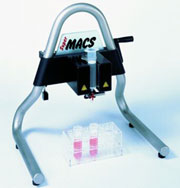 Miltenyi MACS bench-top immunomagnetic cell sorter for cell separations using samples labeled with Miltenyi beads and MACS columns. MACS® Technology is based on MACS MicroBeads, manual or automated MACS Separators, and MACS Columns. When MACS Columns are placed in a MACS Separator, the MACS Column matrix provides a magnetic field strong enough to retain cells labeled with minimal amounts of magnetic material. Therefore, MACS MicroBeads used for labeling the cells can be so small and only a few are needed to separate a cell. The magnetically labeled cells are separated over a MACS Column placed in a MACS Separator. They are retained on the column, while unlabeled cells pass through. These cells can be collected as the unlabeled fraction. The retained cells are eluted from the MACS Column after removal from the magnet. Gentle to cells: Viable and functionally active cells can be separated in less than 30 minutes. Excellent purity and recovery of both labeled and unlabeled cells. Dynall MPC-L bench-top magnetic particle concentrator for cell separations using samples labeled with Dynabeads. Dynabeads® come in several sizes and with different surface functionalities, for use in a wide variety of applications. Some beads are pre-coupled with a biomolecule (ligand). The ligand can be an antibody, protein or antigen, DNA/RNA probe or any other molecule with an affinity for the desired target. Bind: When added to a sample, Dynabeads® bind to the desired target (cells, pathogenic microorganisms, nucleic acids, peptide, protein or protein complex etc). This interaction relies on the specific affinity of the ligand on the surface of the beads. Wash: The beads respond to a magnetic field, allowing bound material to be rapidly and efficiently separated from the rest of the sample. Unbound material is simply removed by aspiration, and the bead-bound target washed by the use of the magnet. Elute: The bead-bound target is released in a suitable volume for use in downstream applications. Alternatively, the bead-bound target can be used directly while still attached to the beads. No centrifugation or columns are required. The protocol is scalable and very automation-friendly. The Dynal MPC-L Magnetic Particle Concentrator contains a plastic housing and a removable magnet slide incorporating high-energy neodymium magnets. The magnet is designed to hold four separate FACS or Vacutainer tubes (10–16 mm in diameter) with working volumes ranging from 1 ml to 8 ml. It can be used with all Dynabeads but for 1 µm Dynabeads (MyOne™) the volume range is limited to 1-5 ml. ACCF provides access to both clinical and basic science investigators. Sample running may be performed by the client himself, assisted or performed entirely by the ACCF staff. Preparation of samples on place as well as using ACCF reagents is possible after preliminary consultation. Users of the core facility who plan to acquire their own samples and wish to operate the Becton Dickinson analytic flow cytometers should take the basic FCM course (for detailes see Rules and Procedures). Immunophenotype: combined expression of 1-4 cell surface and 1-2 intracellular molecules/receptors. The current flow cytometer can sort two populations at the same time. Sorted cells are collected into tubes (bulk sort) The number of cells that can be sorted depends upon the frequency of events to be sorted and total number of the pre-sorted population, as well as the required purity. These can be discussed prior to sorting. Sheath fluid used is sterile PBS unless otherwise instructed, whereupon you will be required to provide the facility with sufficient sheath fluid the day prior to sorting. Upon customers request cell cultivation facilities are available for short-term cultivation before and after the cell sorting. Sorting experiments require obligatory preliminary consultation. Entirely sterile conditions are provided. Upon customers request cell cultivation facilities are available for short-term culture before and after the cell sorting. Long-term projects such as cloning, establishment of cell lines, hybridoma development are envisaged upon request and after preliminary consultation. The Flow Cytometry Core Facility offers its equipment and expertise for the needs of national and international surveys and clinical trials, according to the requirements of GLP. One of the major long-term goals of the facility is to collaborate with investigators in the development of new, leading edge applications of flow technology. Investigators are encouraged to discuss their ideas and/or needs with the director of the facility. 6.1. Free pre-project consultation to discuss the application of Flow Cytometry to the principal investigator's project or proposed use. All users are encouraged (required) to do this. This consultation often provides the PI alternatives, insures that proper controls will be run, and eliminates repeat studies due to technical inexperience with Flow Cytometry. A small library of books, specialised journals and reference materials are available for use. 6.3 Review of data presentation for publication. This service seeks to eliminate errors in data presentation/conclusions thus increasing the chances for manuscript acceptance. The technology of flow cytometry is rapidly growing and highly technical. Errors in sample acquisition and/or data analysis are common among poorly trained users and can lead to misleading and/or unreliable data. The facility staff are committed to providing training and education for all the facility users. Group training sessions at two levels: basic and advanced are available and individual help is provided whenever possible. The basic course provides the indispensable theoretical and practical knowledge for working with a bench-top instrument; advanced courses provide state-of-the-art information on important cutting-edge topics in cytometry. Lectures and hands-on laboratory training are provided by the leading national specialists. Internationally recognized specialists in analytical cytometry and related fields are invited on a regular basis. 7.1 Who should take the basic flow cytometry course? Users of the core facility who plan to acquire their own samples and wish to operate the Becton Dickinson analytic flow cytometers under the supervision of the Core staff. Investigators who plan to use flow cytometry in their research. in order to gain insight into the research potential of flow cytometry techniques. All researchers with own flow cytometers who wish to utilize this training resource. 7.2 Who should take the advanced cytometry courses? Flow cytometry users with the basics skills who are interested to develop their qualifications. Specialists in different fields of research and medicine, as the advanced courses also treat the potential applications of flow cytometry techniques and flow cytometry data interpretation. The basic course is held on an as-needed basis, usually once every month, most often on Mondays and Tuesdays. A minimum of four confirmed students is needed to arrange a suitable class date. The maximum class size is eight students. The advanced courses are held according to the annual program anounced on this site. You are encouraged to confirm your applications as early as possible. A minimum of eight confirmed students is needed for a course to take place. Click here to get information for the next available training course. You are new in the field of flow cytometry? Having technical difficulties with your on instrument? 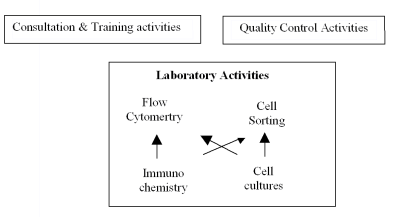 Individual training regarding any aspect of flow cytometry is available by appointment. Contact us for a custom training session. An important area for assuring high quality work is the dissemination of reliable protocols for specific flow cytometry applications. To this end, a protocol page is under construction on the flow facility World Wide Web server for access over the Internet. Basic Protocols for using CD monoclonal antibodies From Research Diagnostics Inc. The participation of laboratories in External Quality Control Surveys is an obligatory element of GLP and QA systems, according to the European legislation standards, the current Bulgarian standards for accreditation of analytical laboratories (ISO/IEC 17025:2005 and ISO/IEC 15 189: 2004) and the Regulation N13/30.07.2003 of the Ministry of Health. ACCF is part of the Central laboratory of Immunology at NCIPD, which was the first medical laboratory in Bulgaria certified according to ISO/IEC 17025:2005 in 2004, currently in process of re-accreditation. Since 2004 ACCF has been organizing an external control survey for flow cytometry laboratories in Bulgaria. Since 2007 this survey has become a part of the System for External Quality Control of the Bulgarian Association for Clinical Immunology. Users wishing to pass samples on their own should provide a certificate for flow cytometry training or take the basic course proposed by ACCF. You may also choose to have our specialists run samples for you, therefore bypassing the need for training. The FACSCanto II 8-color flow cytometer is run exclusively by our trained specialists. Users should schedule time for the specialist to run samples via email, but available times will be posted on the website. A fee will be charged for anyone who signs up and fails to notify the center that they no longer intend to use the time slot. A 12 hour minimum notification to cancel your time slot is required. Unusual or extenuating circumstances for last minute notifications will be reviewed on a case by case basis. Types of Services Offered For Charge (for details contact the head of ACCF).